Sun bear Annemarie caught the world’s imagination when a whole year after her rescue from life as an exotic pet, she was still too traumatised to step outside. After seven years alone in pitch darkness, the immensity of the outdoors was just too much for her. But thanks to the dedicated support of her carers, Annemarie plucked up the courage, stepped outside and realised she was braver than she ever knew. When the time came in June 2018 for Annemarie and her playmates Murphy, Layla, Goldie and Sassy to move from the cub house to an adult enclosure, the group was delighted to explore the largest space they’d ever known since being poached from the wild as cubs. But for Annemarie, the change was a challenge. At first, she didn’t want to explore her large, new enclosure and chose instead to stay in the perceived safety of the dens. Clearly, Annemarie’s psychological wounds continue to run deep, but her carers too remain as determined as ever. With their help and encouragement, Annemarie has overcome this latest challenge and has already come to trust her new environment. “Already, Annemarie is much happier in the new space. It took her more than a year to trust her original enclosure, but it’s taken her just a month to learn to love this one. 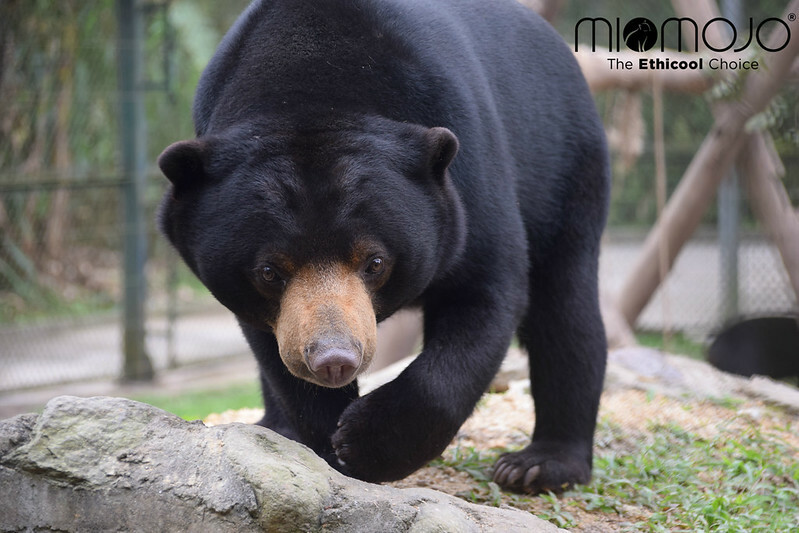 Annemarie and the four other orphaned sun bears in the Miomojo Cub House will be cared for at Animals Asia’s sanctuary for the rest of their lives. They will do so in the best of health, surrounded by toys and bolstered by a nutritious diet – thanks to funding from Miomojo.